Habit: Densely hairy. Stem: prostrate to decumbent or erect, generally simple, 0.3--1.5(3) dm. Leaf: basal 1--8 cm, +- round to obovate or elliptic, margin wavy-dentate to entire; cauline 0.5--1.5(2.5) cm, oblanceolate, entire or sparsely dentate, proximal short-petioled, distal sessile. 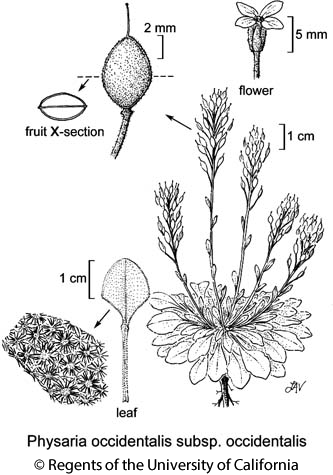 Flower: sepals 4.5--7 mm; petals 7--9(14) mm, spoon-shaped, yellow. Fruit: (5)6--9 mm, ellipsoid to obovoid, strongly compressed parallel to septum, acute at tip, densely hairy outside, sparsely hairy inside or glabrous; style (2)3--6.5 mm, generally sparsely hairy; pedicel 5--10(15) mm. Seed: 4--16, ovoid to ellipsoid. Chromosomes: 2n=10. Ecology: Gravelly soils, talus, ridges, barren hillsides, volcanic rocks, decomposed limestone, schist; Elevation: 600--3350 m. Bioregional Distribution: KR, NCoRH, CaRH, n SNH, MP; Distribution Outside California: to Washington, Idaho, Nevada. Flowering Time: Apr--Aug Note: Physaria occidentalis subsp. cinerascens (Maguire & A.H. Holmgren) O'Kane & Al-Shehbaz in Nevada, Utah. Citation for this treatment: Ihsan A. Al-Shehbaz 2012, Physaria occidentalis subsp. occidentalis, in Jepson Flora Project (eds.) Jepson eFlora, http://ucjeps.berkeley.edu/eflora/eflora_display.php?tid=89270, accessed on April 19, 2019. KR, NCoRH, CaRH, n SNH, MP; Markers link to CCH specimen records. Yellow markers indicate records that may provide evidence for eFlora range revision or may have georeferencing or identification issues. Purple markers indicate specimens collected from a garden, greenhouse, or other non-wild location.